Top scorer J’Vonne Hadley broke a school record for points in a game set by a player on the 1961 tournament team. Plus three story lines for the 3A tournament. Mahtomedi, making its first boys’ basketball tournament appearance since 1961, has parallels to that team from 58 years ago. Those Zephyrs were led by 6-6 forward Mike Patterson, who scored a school-record 50 points in a game. These Zephyrs look to 6-6 guard J’Vonne Hadley, who broke the record with a 52-point game this season. Hadley averages 27.8 points per game for the the No. 5 seed Zephyrs (24-5). They open Class 3A state tournament play at noon Wednesday at Williams Arena against No. 4 Princeton. Mahtomedi’s state tournament breakthrough, after three section final losses in the past four seasons, owes to more than any individual player. Senior guard Zac Centers set a program record with 108 three-pointers made. He averages 15.3 points per game. Melzer averages 11.1 points per game and ranks second to Hadley in assists and rebounds. After their high-scoring trio, the Zephyrs benefit from the varied contributions of players such as senior guard Sam Bell (clutch play), junior forward Cole Chapman (defense), senior forward Andrew Murphy (energy) and junior forward Luke Ricker (versatility). Players discovered their strengths and formed their roles during summer basketball — to encouraging results. “Going to summer tournaments and playing well against Park Center, Minneapolis North and Hopkins told us that we had a good group of guys and could compete against the top teams in the state,” Melzer said. 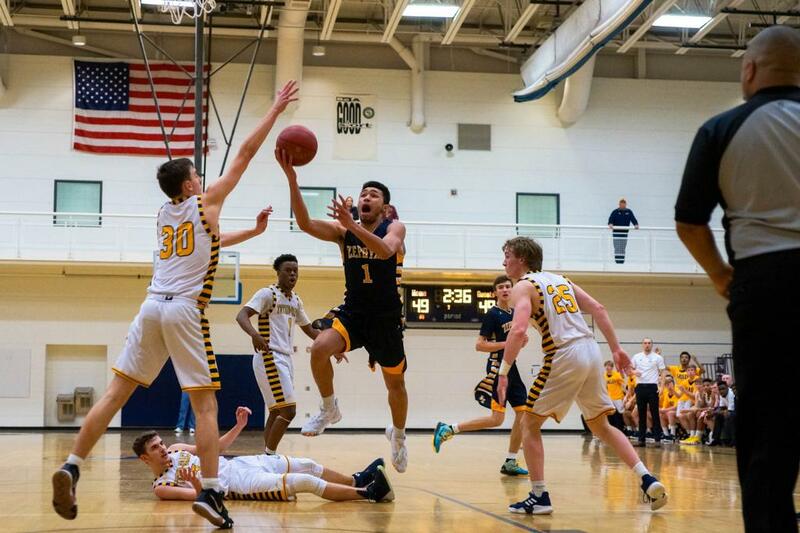 The confidence lasted into the Section 4 playoffs, where the Zephyrs dispatched nemesis Columbia Heights in the semifinals and Totino-Grace in the championship game. Keith Newman, in his 13th season as Mahtomedi’s head coach, brought perspective to the long-awaited state tournament appearance. Half of the teams return to the state tournament for the first time in many years. Holy Angels last reached the final eight in 2004. Not since 1985 has Bemidji represented. That’s nothing compared to Mahtomedi and Princeton, which can count the decades since their last state tournaments. For Mahtomedi, that was 1961. John F. Kennedy was the U.S. president. “Even guys who played for Mahtomedi back in the day have said good job,” senior forward Devin Melzer said. For Princeton, try 1932. Yep, 87 years. The country was mired in the Great Depression. Top players in Class 3A offer a variety of statistic delights and other accolades. Holy Angels senior guard Charles Johnson leads the metro area with 4.5 steals per game. Austin’s Ngor and Dongrin Deng are identical twins. They score a combined 15.4 points per game. DeLaSalle senior guard Tyrell Terry, a three-year starter, is both a McDonald Award and Mr. Basketball finalist. He averages 22.1 points, 7.7 assists and 2.8 steals per game. Four Princeton players surpassed 1,000 career points: James Flicek, Reilly O’Neil, Jon Stimmler and Adam Williams. Waseca’s Malik Willingham became the program’s all-time leading scorer at 1,961 points. Of course it does. But several teams are capable of testing that axiom. Six of the tournament qualifiers rank among the top eight in Class 3A scoring. Princeton (84.8 points per game) is first, followed by Waseca (83.8), DeLaSalle (78.4) and Mahtomedi (78.3). Holy Angels ranks seventh (75.6) with Austin (72.6) one spot behind.